News outlets shy away from publishing the controversial images of the paper's satirical cartoons of the Prophet Muhammad. The cartoon of Muhammad that appeared on a 2011 cover of Charlie Hebdo. WASHINGTON — Major newspapers, television channels and websites have chosen not to run cartoons of Muhammad by the satirical French newspaper Charlie Hebdo after a deadly attack on its offices Wednesday. 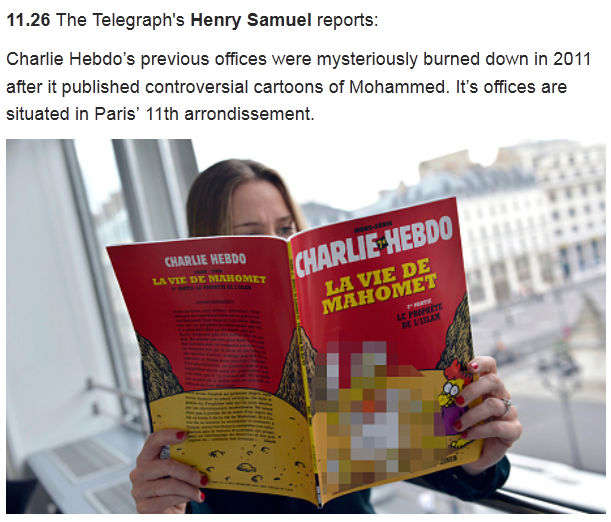 The Telegraph also used a tightly cropped image of Stéphane Charbonnier, the director of Charlie Hebdo known as Charb, who was killed when masked gunmen attacked the paper's offices, killing 12 people, including employees and police.
.@telegraph: You mistakenly cropped this picture a little tight. However, The Telegraph reported that the BBC actually lifted its ban on depicting Muhammad, though the television station claims it did so before the shooting. The Telegraph reported Monday that there was some confusion at the BBC because official policy stated Muhammad must not be depicted. However, the television station seemed to counter that policy by showing Charlie Hebdo images as part of its coverage. A spokesman for the BBC told The Telegraph that the Muhammad policy is under review. The television station said that it was already reviewing its policy before the attack. "This guidance is old, out of date and does not reflect the BBC's long-standing position that programme makers have freedom to exercise their editorial judgment with the editorial policy team available to provide advice around sensitive issues on a case-by-case basis," the spokesman told The Telegraph. The New York Daily News also used blurred images of the Muhammad cartoons. This shows a pixelated photo of the 2011 "Charia Hebdo" issue that depicted Muhammad on the cover, and for which Charlie Hebdo's office was firebombed. In the second example posted here, the cover shown is the "Intouchables 2" cover from 2012, which did not even depict Muhammad on the cover — the cover shows cartoons of an imam and a rabbi. There were Muhammad cartoons inside the issue. The editors of The Telegraph and the Daily News did not immediately respond to requests for comment about the decision to censor the images. But the New York Times explained their decision not to show the images in an email from a spokesperson: "Under Times standards, we do not normally publish images or other material deliberately intended to offend religious sensibilities. After careful consideration, Times editors decided that describing the cartoons in question would give readers sufficient information to understand today's story." Other outlets made more subtle choices to censor the images, with some using cropped photos that do not include the actual image of Muhammad. Three images of Charb were released on the Associated Press wire after the shooting, and none of them included a photo of the cover itself. AP spokesman Paul Colford told BuzzFeed News, "You're correct: None of the images distributed by AP showed cartoons of the Prophet Muhammad. It's been our policy for years that we refrain from moving deliberately provocative images." Many news organizations chose to use the above AP photo, despite the fact that the AP did have more than one photo of Charb holding the cartoon at the time in its system, and most of them show it. Shown the four images in the tweet linked above, which has now been deleted but included three photos that showed the cover, Colford said that those three photos were taken by non-AP staff photographers and were removed from the AP's commercial photo system later Wednesday. "The top right image in that tweet you sent – very much cropped by us to exclude the illustration – is the only AP staff-taken photo among the four. The other three are SIPA photos, automatically fed to AP's commercial photo division and now being removed from our system," he said. The choices news organizations face in publishing the cartoons recall the controversy over a Danish newspaper's publishing of Muhammad cartoons in 2005 and 2006. The cartoons inspired protests and boycotts around the world, as well as death threats against the newspaper and cartoonists. Some outlets published the cartoons in solidarity with the newspaper, while others decided to censor them: CNN pixelated the images that it showed of the cartoon. On Wednesday morning, CNN again reportedly showed pixelated images of the Danish cartoon and did not display images of the Charlie Hebdo cartoons. "As this distressing story continues to evolve we are actively discussing the best way of addressing the key issues and images across all of our platforms," a CNN spokesperson told BuzzFeed News. "Those conversations will continue throughout the day and beyond as the story develops." A CNN memo obtained by Politico showed the network would not show images of the cartoons. "Although we are not at this time showing the Charlie Hebdo cartoons of the Prophet considered offensive by many Muslims, platforms are encouraged to verbally describe the cartoons in detail," the memo says. It states that photos of the cartoons held by demonstrators during protesters are "OK, if shot wide." CNN is not the only network not showing the cartoons — in fact, all the major networks and cable channels are declining to show them. Asked whether NBC News would show images of the Muhammad cartoons in the course of its reporting on the story, a NBC News spokesperson said, "Our NBC News Group Standards team has sent guidance to NBC News, MSNBC, and CNBC not to show headlines or cartoons that could be viewed as insensitive or offensive." Spokespeople for both ABC News and CBS News confirmed to BuzzFeed News on Wednesday that they would not show the Charlie Hebdo cartoons of Muhammad, though a CBS News spokesperson said later that "CBS News will make an editorial decision based on the relevancy to the story." And Fox News, though it did show a shot of one of the cartoons earlier, told the Washington Post that it has "no plans" to air it again. Get real, folks. A Jewish newspaper like mine that published such cartoons would be at the front of the queue for Islamists to murder. BuzzFeed editor-in-chief Ben Smith declined to comment on why BuzzFeed News is publishing the images in the course of its reporting on the story.